Revitalizing treatments for many ailments: Over the centuries, Ayurvedic medicine has adopted therapies and solutions for an endless range of conditions. It has been used to help a variety of illnesses and ailments ranging from digestive problems, to hair loss, to gastric issues, mental stress, weight related issues, skin problems and insomnia and even arthritis. The powerful release of toxins from the body that Ayurveda facilitates helps to restore the body’s internal balance and provides relief, a boost in immunity and energy and promotes overall health and well-being. Tailor-made treatments and therapies: Ayurveda does not follow a “one size fits all” approach, and at Jetwing Ayurveda Pavilions, each treatment is carefully curated to heal, rejuvenate and restore an individual based on their unique requirements. Some of the most popular treatments provided at the hotel include the Panchakarma programme, which is 10-30 days long and is carefully personalized to one’s specific health needs. The primary focus of the programme is to purify and detox the body using five different therapy options. For a shorter, intense programme Purva Karma provides a variety of treatments that use a wide range of natural oils and herbal pastes to ease stress and anxiety and revitalize the skin and body. The hotel also offers natural wellness and full-board programmes for guests who seek deeper and more intense healing therapies over longer periods of time. Whether you’re pressed for time and just have a few days to spend, or you have an entire month that you can dedicate to a holistic getaway, each treatment can be designed around your specific needs. 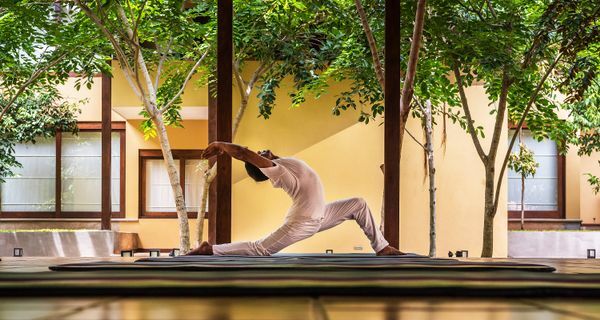 Additional benefits that promote holistic well-being: In addition to its broad portfolio of traditional Ayurvedic treatments and therapies, Jetwing Ayurveda Pavilions also offers guests the opportunity to take part in a variety of complementary activities. Ease your mind with yoga and meditation between treatments or participate in a music therapy or aquatic exercise session to give your senses a gentle boost. A hotel that’s fully geared for wellness: Located a short drive away from the airport, Jetwing Ayurveda Pavilions is a tranquil hideaway that tunes out the hubbub of city life. Stepping in through the doors of this getaway, you will be transported to a truly picturesque and tranquil setting that is rich in nature and filled with soothing spaces. Inspired by the warmth and rustic charm of a Sri Lankan village and drawing further inspiration from nature and the ancient heritage of Ayurveda itself, the hotel has been designed to serve as the ultimate getaway that offers peace, serenity, a calm base and the ultimate location to embark on your holistic holiday. Home to the island’s top doctors and therapists: Each and every treatment at the hotel is carried out by the finest team of Ayurveda experts comprising twelve professional therapists, under the purview of four experienced doctors, each of whom hold a Bachelor of Ayurveda Medicine and Surgery (B.A.M.S.) degree. Prior to each therapy or treatment process, one of the resident doctors will conduct a careful assessment of your current health and find any issues and concerns that need to be addressed. Your doctor will carefully look at your vatha, pitha and kapha – the three doshas (life forces) that are believed to be a part of every human being. Factoring in these findings with the duration of your stay, customized therapies and sessions will be mapped out to detoxify your entire body and mind and improve your health and wellness.